Peppermint is the flavor of the season — from bark to cookies, its minty freshness can be found in just about anything your sweet tooth desires. Pizza for dessert? Yes, please! Minty, creamy, and sweet, this take on a savory turned sweet pie is just so much fun to make (and even more fun to eat!). 1. On a parchment-lined cookie sheet, create a 10-inch round “pizza” with your cookie dough. Simply break it apart and smoosh it into shape using your hands. 2. Bake the pizza until golden, about 15 minutes. 3. Beat the cream cheese and butter until completely combined and smooth. 4. Add in the melted white chocolate, vanilla extract, and peppermint extract. It’s a good idea to make sure the chocolate is ever so slightly cooled before adding it to the mixture so you don’t end up with a melty mess. 5. Slowly beat in the powdered sugar until frosting is smooth and all sugar is incorporated. 6. 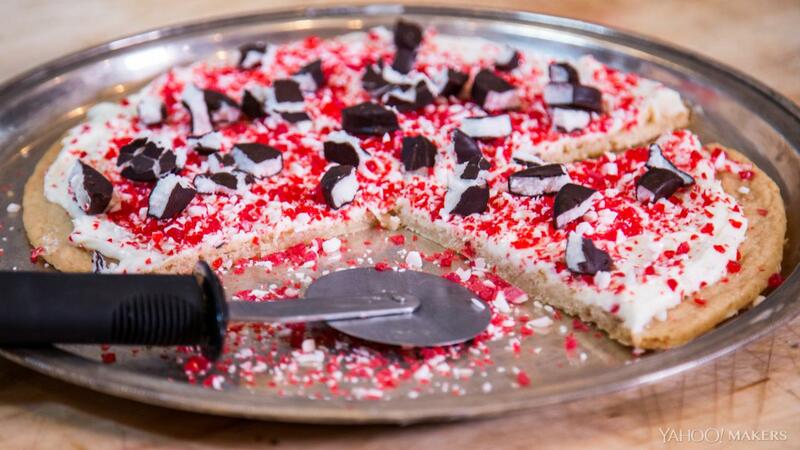 Frost your cooled sugar cookie pizza crust, then top it with crushed peppermint crunch and crumbled pieces of peppermint patty.